While we have looked at a number of very long bridges here on Google Sightseeing in the past1 generally they have all carried roads. 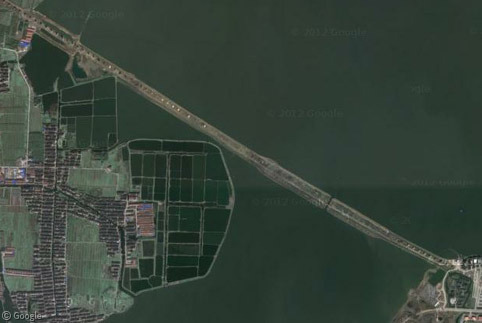 Today, the longest bridge in the world, by far, is the Danyang-Kunshan Grand Bridge – a 164.8 km (102 mile) elevated high speed rail line in China. 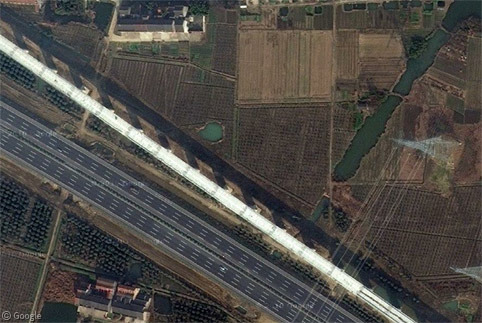 Part of the 1,317 km (818 mile) Beijing-Shanghai High Speed Railway, the Danyang-Kunshan bridge carries the track the final step of the journey, covering much of the distance between Nanjing and Shanghai. 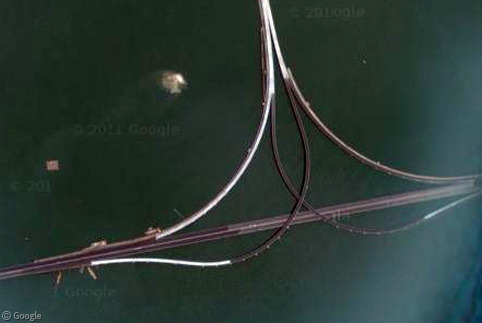 At the time of writing, the Google imagery covering length of the bridge is a patchwork of different time periods. This means that we can actually see it in various stages of construction, from before work started through to a completed structure. 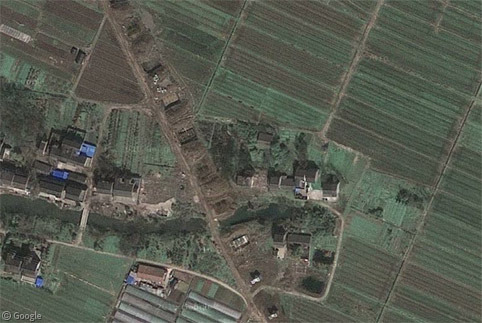 We’ll follow the route from west to east, beginning in Danyang – the construction work is just visible in this low-resolution image but generally the imagery running east from Danyang dates back to before the start of construction, so we can mainly see farmland along the path of the track. Building such a huge structure in only four years was obviously a mammoth task – up to 10,000 labourers were employed in its construction, and is estimated to have cost £5.4 billion ($8.5 bn). Trains started running on the track in the summer of 2011. 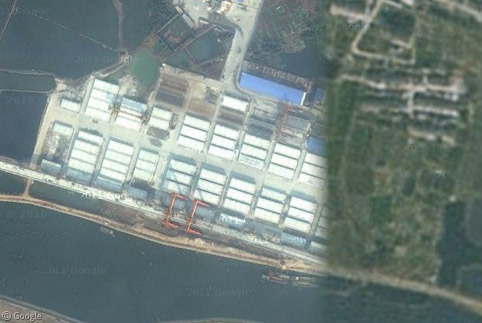 Moving further east we suddenly jump forward in time when we come to imagery where the structure is visible, though apparently still under construction in many areas. A little further east and we reach the first of several large complexes which appear to where the individual sections of the bridge were constructed. I haven’t been able to find many details about the construction methods employed, but I would surmise from this image that concrete bridge segments were cast at sites like this and loaded by crane onto transport vehicles. They would then have been carried along the track before being lowered onto the supporting towers. Travelling further we come to a different set of images where the completed bridge is illuminated by a low sun, casting a lovely shadow. 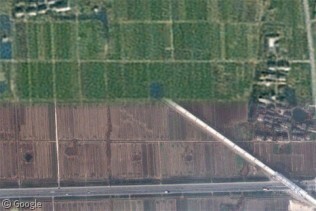 For part of this distance, the track runs beside a (mostly empty) eight-lane highway. Continuing along, we reach a point where we see the bridge construction actually in process, with a large piece of machinery at the end of a completed section, and pre-constructed towers running east, 80m apart, waiting to receive the completed bridge segments. Around 2,000 pillars were built to support the bridge. Where the route reached obstacles such as roads or rivers, sections of track longer than the regular 80m span were built in advance so that installation of the pre-cast segments was not delayed. 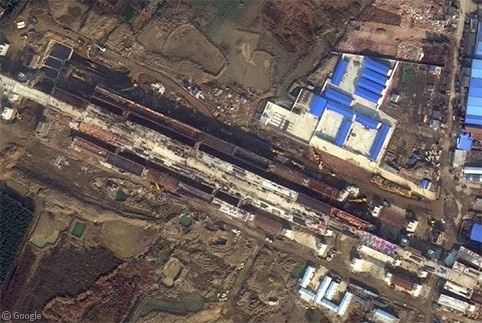 Larger construction sites along the way are probably stations. 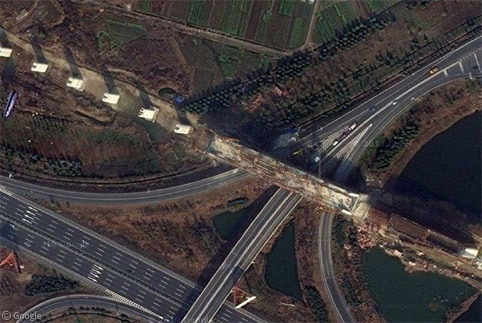 As we travel across the patchwork of time, in newer imagery the former bridge-segment construction sites are in the process of being cleaned up, while a short distance away, older imagery has a crane still in action. And just a little further an active construction site is cut off by much older imagery with no sign of the bridge at all. We then reach a section of imagery showing the very earliest stages of construction, with the land being prepared for the construction of the towers, with some newly-completed ones to the south. 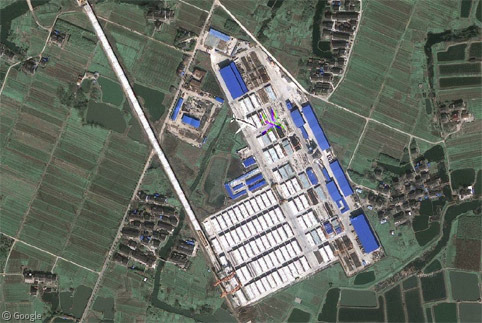 Here we see one of the largest construction sites with track laid a short distance north, but without towers even built to the south. And in an interesting mix of transportation modes, an airplane happens to be flying overhead! 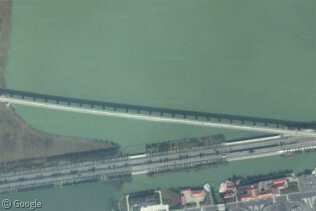 While the bridge has been described on various sites as “crossing 9km of Yangcheng Lake”, in face the causeway that crosses part of the lake looks to be only a couple of kilometres long. 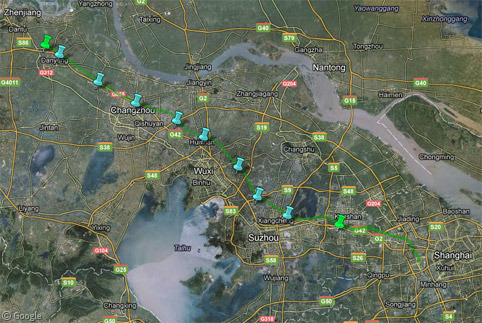 There are also another couple of short sections over water further east, but not 7km worth. 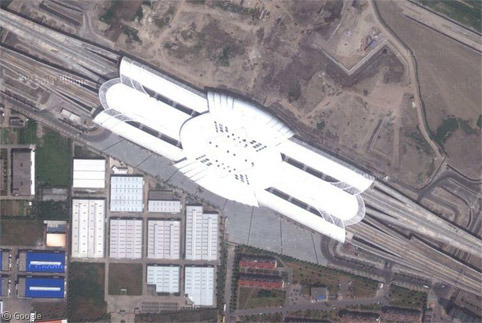 The bridge ends at this rather futuristic-looking station at Kunshan on the outskirts of Shanghai, though the track continues into the city at ground level. Having now reached the end of this staggeringly long bridge, sadly I must admit that along its entire length I wasn’t able to find any imagery new enough to show trains running on the track! 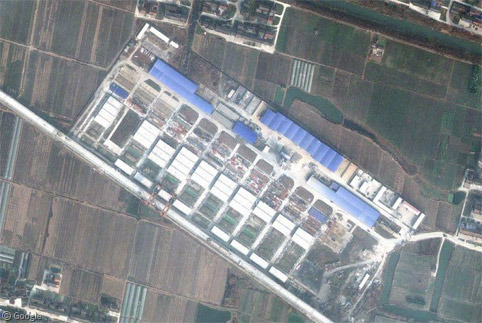 Considering the scale of this project, there is surprisingly little information about it online. The Wikipedia page is minimal, to say the least. 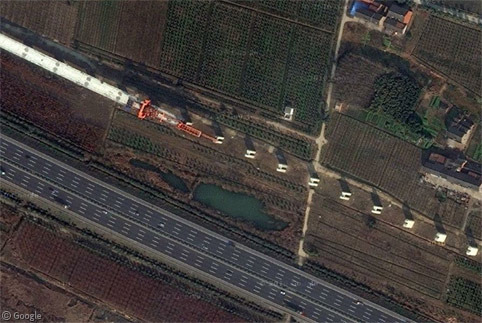 And many pictures which claim to be the Danyang-Kunshan Bridge are clearly road bridges. This Spanish page does have a few good images, but please post in the comments if you find any other relevant pages! This is cool and all, but it’s not a bridge. It’s a viaduct. viaduct a long bridge-like structure, typically a series of arches, carrying a road or railway across a valley or other low ground. Thanks for your comments, Steven and Tammo. I realised when writing the post that there was a potential problem with the description of it as a bridge, but as the name of the structure is the Danyang-Kunshan Grand Bridge, and Wikipedia includes it in its list of longest bridges, I felt it was good to go with it. Though to split hairs even more, one could argue that it’s not actually a viaduct because it’s not carrying the track across a valley or low ground. It’s a bridge because it’s carrying across ‘other obstacles’ – all high speed tracks try to avoid having level crossings or anything else at grade that could cause a hazard for the tracks, so elevating the track is one solution. 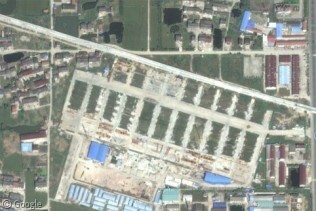 The structure you refer as “large construction site” & “possible station” is actually Changzhou North. The rest of the station can only be seen by checking the Panoramino pictures nearby or other sources like Openstreetmap, Wikimapia or Baidu, the Chinese pendant to Wikipedia. 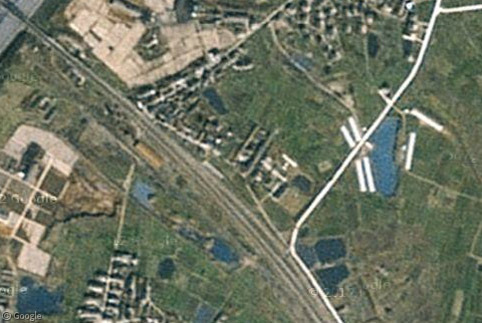 Even Yahoo Map knows at least the location of the high speed line. Regarding the causeway: I’m not sure if this is a final structure or if they only temporary dammed off the lake. Check out also all the pictures of the stations, which are listed above. There are also pictures with trains in the stations. Thanks, Peter, for your detailed input.